Continuing a recent crackdown against members of the Falun Gong sect, Chinese police arrested 1,200 government workers Saturday, accusing the officials of practicing the banned exercises characteristic of the Falun Gong meditation system. Hours later, 200 Falun Gong members occupied a park in Hong Kong to protest the government’s hostile actions toward the group. Falun Gong, also known as Falun Dafa, is a Qigong system of meditation and exercise introduced to the Chinese public in 1992 by Li Hongzhi. Li, known as “Master Li,” currently lives in New York. China has issued an arrest warrant against him, although the U.S. State Department has refused to extradite the Falun Gong leader. He and other MIT practitioners of the movement have begun a campaign against the crackdown, claiming that the government has abused innocent citizens and violated international human rights. “There are over 200 of us here in Boston,” He said. “Many are alumni of MIT, BU, Harvard, and Tufts. 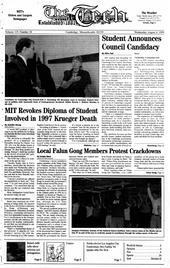 We even had a practice group centered at MIT a few years ago,” he said. Since issuing a ban on Falun Gong last Thursday, over 1,600 members of the group have been detained, although leaders of Falun Gong claim that the movement has over 100 million followers in China alone. Chinese police have ransacked the homes of Falun Gong practitioners and have confiscated books, videotapes, and posters. Many of those arrested by the police have been detained in “re-education camps.” Letters written by the detained members claim that followers are being held without food or other provisions. Not all agree with He’s statement that Falun Gong has no political agenda. Li has repeatedly denied that his practice is politically-motivated. However, China’s communist leaders maintain that they are attempting to preserve stability in China and are even helping those people they have detained. The Xinhua news agency has issued reports that members of Falun Gong have been killing themselves and others, and therefore need to be treated or re-educated. He explained that Falun Gong is based on ancient Chinese principles that convince people to give up anger, anxiety, jealousy, and desires for fame. The group’s guidebook, Zhuan Falun, explains that each individual possesses a falun, or law-wheel. The falun is like a miniature universe and has its own form of existence and process of evolution. Recent reports from the members in charge of American Falun Gong websites have claimed that their websites have been hacked in attempts to shut them down. Unconfirmed reports from webmasters say that the hacks have been traced to Beijing and government offices. Meanwhile, two of Hong Kong’s largest bookstores have stopped selling Falun Gong books, although spokesmen for the bookstores have refused to indicate why the books have been removed from shelves. Hong Kong, has not banned the movement.